Five college men’s volleyball players have earned national awards for being the best at their position. 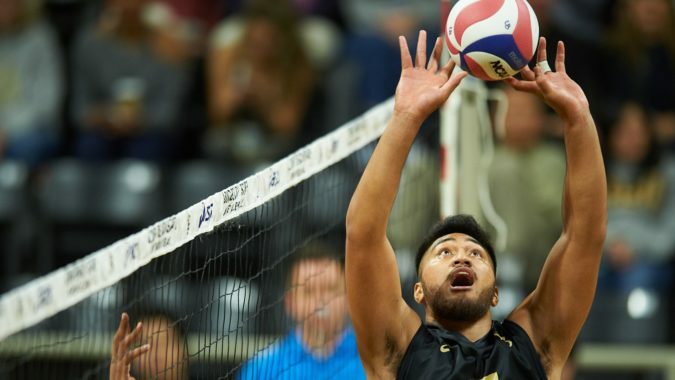 Lincoln Memorial’s Evan Cory, UCLA’s Daenan Gyimah, Belmont Abbey’s Collin Lockwood, Long Beach State’s Josh Tuaniga and Pepperdine’s David Wieczorek were all selected for the Off the Block National Position Player of the Week Awards. Tuaniga guided offense to a season-high .514 attack percentage and had a match-high five digs as No. 1/1 Long Beach State swept Penn State on Friday at the AVCA Showcase. He also led Long Beach State to a .475 attack percentage in a sweep versus Ohio State on Saturday in the non-conference tournament finale. Cory had a combined 58 kills and eight aces in three matches last week, including more than 20 kills in two of the matches. The junior had both a season-high 26 kills and nine digs in a five-game loss to King on Tuesday and then had 21 kills in a four-game victory against Erskine on Saturday. In addition, Cory finished with 11 kills and zero attack errors while hitting .579 as Lincoln Memorial swept Coker on Friday. Wieczorek finished with 14 kills and zero attack errors on a season-high .737 attack percentage and added three aces as No. 5/5 Pepperdine swept No. 9/9 Stanford in Friday to remain undefeated in conference play. The All-American also had a season-high five aces and led Pepperdine with 12 kills while hitting .435 in a sweep against No. 7/8 BYU on Wednesday. Gyimah led all players with a career-high 25 kills on a .553 attack percentage and added three blocks as No. 4/4 UCLA playing without multiple starters because of injuries beat No. 9/9 Stanford in five games on Thursday. He also contributed eight kills while hitting .500 and had three aces in a four-game victory against No. 7/8 BYU on Saturday. Lockwood had a season-high 12 digs to help Belmont Abbey upset St. Francis in four games on Saturday. The sophomore also finished with eight digs in a four-game loss to Mount Olive Friday.